CANBERRA, Australia (AP) — Australia's prime minister came under pressure from his own lawmakers on Thursday to revise his economic agenda after his weakened coalition scraped through one of the nation's closest ever elections. Prime Minister Malcolm Turnbull's center-right Liberal Party lost at least 14 lawmakers, including some of Turnbull's key moderate supporters, in knife-edge polls on July 2 that left the coalition with a majority of only one or two seats in the House of Representatives where parties form government. Some mail-in votes are still being counted. Some government lawmakers blame the surprise swing against the government partly on plans to increase taxes on the pension funds of wealthy Australians. Such public criticism of official policy from government lawmakers is rare and proof that the election victory has not healed deep rifts in the administration's ranks. Liberal Party Senator Eric Abetz, who was demoted from cabinet when Turnbull became prime minister less than a year ago, said Turnbull must consider changing the pension fund tax plans and other policies when government lawmakers meet on Monday. "When you've just had such a big kick up the pants as we've just had as a coalition ... I think it is worthwhile to ask the question: Why did we hemorrhage ... so many votes, ... is there are lesson to be learnt and would the Australian people actually want us to recalibrate some of those policies?" Abetz told Australian Broadcasting Corp.
Turnbull said his narrow election win gave his government a mandate to implement all the policies he had campaigned on. "We took a very clear set of policies to the election, we campaigned on it very clearly and that's what we'll be presenting" to the Parliament, Turnbull said Wednesday. But Abetz questioned that mandate. "A lot of our colleagues see the election result as the barest of victories, if we can call it a victory," Abetz said. "Having just fallen over the line, I think it might be wise for the leadership team to listen to some of us backbenchers." Chris Back, another Liberal Party senator, agreed that aspects of the pension fund tax policy "seemed to be unfair" and changes should be debated within government ranks next week. 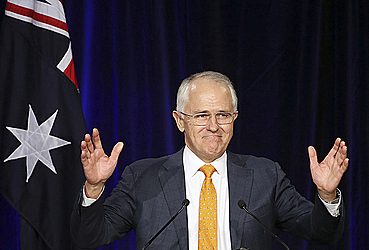 Turnbull, a moderate in the government, replaced the polarizing and socially conservative Prime Minister Tony Abbott in an internal government showdown in September. Turnbull immediately fired some of Abbott's more rightwing ministers, including Abetz. Turnbull is under internal pressure to promote Abbott to his new cabinet to be announced next week.